This dog fetish hood includes a zipper across the mouth, a studded collar and metal ring for attaching a lead or restraint. Lace back to fit all sizes. Woof, wooff! 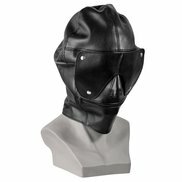 Dog-shaped hood made of black leatherette material with zipper across the front of the muzzle. Lacing in the back for a secure fit. 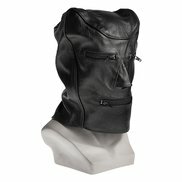 The collar at the base of the hood includes studs and a ring for attaching leads or other restraints. Straight away you can tell this mask is not real leather but that doesn't make it any less immersible. It feels great when you have it on and it is comfortable too. If you have a larger sized head the coverage at the back would not be great but when you see yourself in the mirror with the mask on you feel amazing. For beginners that do not want to spend over £100 on a mask this is perfect in every way :) It can be used with a gag but its a very tight squeeze. Getting into petplay, a mask like this is great for beginners like me. It's cheap but looks great. Comfortable and well priced too. Be warned, it is difficult to get on though if you do have a big head and the coverage of the back of the head isn't great. Not tried using lead on the ring but would do so with care.